Aside from wading into the Brexit headlines, Trump faces dissent within his Party, as the Republican-led Senate voted to block the President’s declaration of an emergency at the Mexican border, preventing him from accessing funds to start building the wall. Trump responded on Twitter with ‘VETO’. It appeared that the Senate were concerned of becoming an ultimate power, in overriding a law passed by Congress, rather than a balancing power. Meanwhile, Beta O’Rourke, the popular Texas Democrat who nearly unseated Republican Senator Ted Cruz in last year’s midterm congressional elections, has formally announced his presidency bid. He enters a crowded field as a moderately progressive candidate who wants to reform both the immigration and justice systems. Trading domestic politics for international politics, hopes of a trade deal have diminished further as a Trump-Xi meeting looks to have been kicked back further, from April to May. US stocks moved lower on Thursday following the news, ending a 3 day winning streak which had led the S&P 500 to its highest level since November. The FTSE 100 is up 1.03% this week. The 10 year Gilt yield has risen to 1.23%. Nvidia shares were sky high (+7%) following a bid of $7bn for Israeli’s cloud-computing semi specialist Mellanox Technologies. It was a difficult day for retail on Wednesday as heavyweights Adidas (-3%) and Inditex (-4%) were down as headline figures disappointed. It may require some sole-searching from management. Standard Life Aberdeen shares were up on news that the controversial joint-CEO structure was to be abolished, with Martin Gilbert, who set up Aberdeen Asset Management, stepping down. He will remain as vice-chairman. Kier group (-12%) has again admitted an error in its net debt level. Prudential released a decent FY results, with shares flat on the news. They provided assurance that the spin off of its UK business was progressing well and that Asia remains the growth engine for the company. “Alexa – what is now being used to help calculate the cost of living in the UK?” …. Alexa: “I am”. 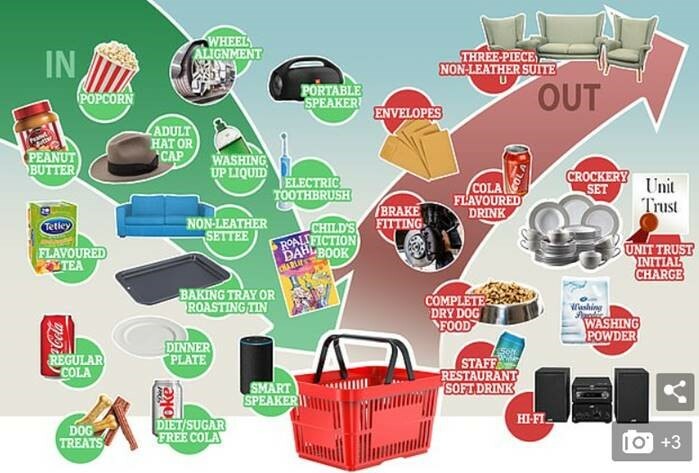 Smart speakers, such as the Amazon Echo device, have been added to the basket of goods and services used to measure inflation. In addition, the introduction of baking items, such as trays and roasting tins, may be a result of the success of the Great British Bake Off.